Brain Tumor Family Camp was great! This year’s Brain Tumor Family Camp was another successful program. We had 15 families join us. This year we welcomed four new families to BTFC; this equated to 19 new participants to the program. The convenience of this program held over a weekend, plus the familiarity of the schedule, makes it a favorite among the families. We would like to thank Kris Riley and Jill Kulbok for their leadership and all the volunteers that supported the Brain Tumor Family Camp program. We would also like to thank the Ellen Marks Cancer Foundation for continuing to sponsor this program! Thank you to Jordan Moeller for leading this event, his incredible performance and to all who performed at and supported the One Skate At A Time event! This was their 7th event supporting Camp One Step and this year they raised over $9,500!! Chicago Day Camp was Awesome! We were so happy to have 15 incredible campers join us for our weekend program. We had several new activities, which included the Lincoln Park Zoo, DuPage Children’s Museum, and California Pizza Kitchen. Many thanks to DePaul College Prep for hosting our program for the weekend. Thank you to Julie Hecktman for leading this program and for all the volunteers for their great work. Special thanks to the Make Your Mark foundation for sponsoring this program! 2018 One Step Charity Poker Championship Ups the Ante’ for Children’s Oncology Services. CHICAGO, IL – On February 22rd, more than 220 pokers players and 75 spectators filled the Montgomery Club to help to send more kids with cancer to Camp One Step. Dan Bernstein from WSCR “The Score” AM 670 and a board member of the nonprofit returned as emcee for this 13th annual No-Limit Texas Hold ‘Em tournament that raised more than $105,000. Players from all over the Chicagoland-area and Northwest Indiana played their best hand for an evening of poker and high stakes gambling, memorable food and drinks, prizes and of course, charity. Celebrity bounty players included NBC’s Chicago Fire Randy Flager, NBC Chicago’s Marley Kayden, WSCR “The Score” AM 670 Laurence Holmes and Danny Parkins and National Movie Critic and FOX Chicago host Richard Roeper. Players of all levels competed for approximately $15,000 in prizes including the coveted Grand Prize: a seat at the 2018 World Series of Poker Main Event in Las Vegas. Event sponsors included R.W. Baird, Perl Mortgage, Bill’s Heating and Air Conditioning, Milwaukee Brewing Company and Associated Agencies. Light snowfall was “snow” problem for the 2018 Utah Ski Program. Going into the program, the area hadn’t received much snow, and we arrived into warmer weather than in the Midwest. That didn’t stop the campers and staff from having an amazing week. Some of the new activities were attending a basketball game for the Salt Lake City Stars, and sled hockey at the National Ability Center. 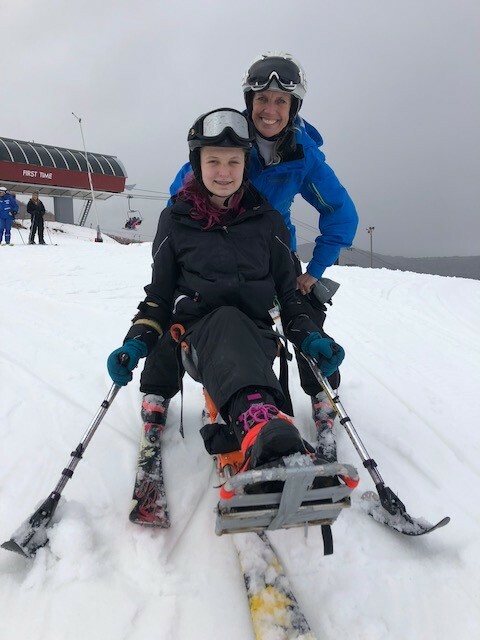 We are pleased to continue to partner with the National Ability Center to be able to bring this experience to more campers each year. This year was the first time that the volunteer Co-Directors Erin Hyerczyk and Austin Cappelle led the program. Erin and Austin are both former campers that have continued to be involved in camp into adulthood by returning as volunteers. Having two former campers become leaders of this program was great for the organization. We are very proud of all they did this year and excited to see their new ideas for the Utah program begin to be implemented in 2019!